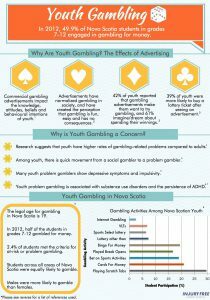 Thanks to Gambling Awareness Nova Scotia for funding to support the Know the Facts campaign. Gambling addiction affects the brain the same way that substance addiction does. There is a myth that you can only become dependent on substances, not behaviours. 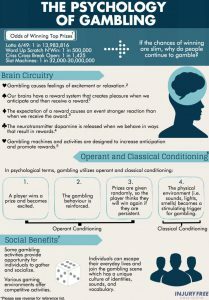 Learn how some forms of gambling are specifically designed to create addiction. Read a list of 10 Electronic Gambling Myths. There is no such thing as an “addictive personality”. Different types of gambling have different levels and types of risk of harm. For instance, a 50/50 draw at the rink has a very low level of risk, but Video Lottery Terminals (VLTs) harm about 1 in 4 of regular users and 1 in 21 of all users. Learn about the different risks of the gambling options in Kings County, and how to make informed decisions when engaging in this as a recreational activity. Gambling affects all of us – whether we gamble or not! Most people seem to think that gambling harms are all about “problem gamblers” rather than about “the gambling problem”. 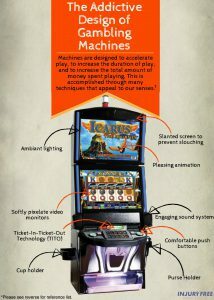 See the Impacts of Gambling infographic. – individuals, relationships, organizations, community and society. 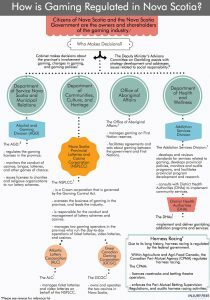 See the Gambling Harm Impacts Us All page that shows how gambling can harmfully impact families, youth, seniors, local business, and more – not just individual gamblers. Use the drop-down menu from the “Know the Facts” button to browse more information. 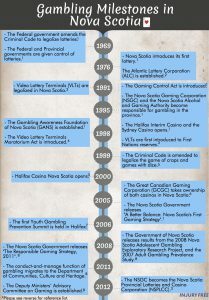 The stats indicate that about 50,000 people are likely to be affected by gambling in the Annapolis Valley. 5,000 directly, and ten times that many indirectly. The problem cannot be solved just by treating those harmed by gambling. We need a comprehensive approach to creating a safer gambling experience for all. This will include friends, family, local organizations, local business, local government, and provincial policy. See the Gambling Harm Prevention page for how to start! See how Norway made VLTs safer. Click on the images below to see detailed infographics and references. Infographics developed by Injury Free Nova Scotia, 2015. Used by permission. About 1,872 people in Kings County are experiencing significant harm because of their gambling. 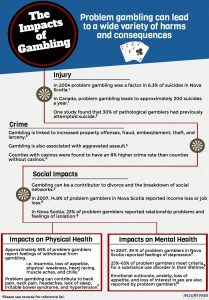 According to a 2007 Prevalence Study2, more than 4,967 residents in the Annapolis Valley are gambling at some level of risk. Gambling harm is most damaging to the disadvantaged people in our county: the poor, senior citizens, youth, people dealing with other addictions and people with mental health problems5. 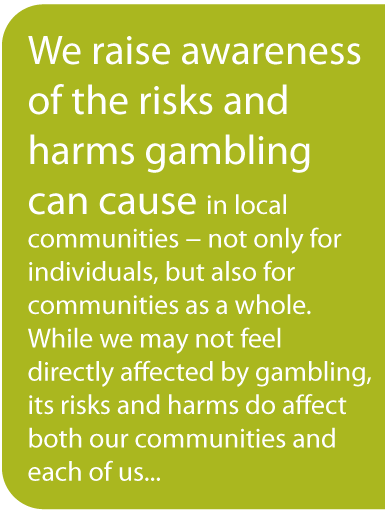 But like the ripple effect of a pebble thrown into a pond, gambling harm affects everyone in our community. It is estimated that for every gambler, ten others in his or her life are affected. And every citizen in the county pays more taxes to cover the costs to social services, justice, health, mental health and addictions services – way more costs than the government receives in gambling revenues3. About $4 million leaves Kings County every year from VLT revenues going to the province4. Imagine the economic impact for local business if there was that much extra money spent in the county each year! Research shows that the neurochemical changes that occur in the brains of gambling addicts are the same as in people who are addicted to substances (see Sunderworth & Milkman , “Behavioral and neurochemical commonalities in addiction” in Contemporary Family Therapy, Vol. 13, #5). See also this press article based on a recent study in the journal Nature. Information received by email on request from the Nova Scotia Provincial Lotteries and Casino Corporation (NSPLCC) for 2012. See also our Resources and Research sections.